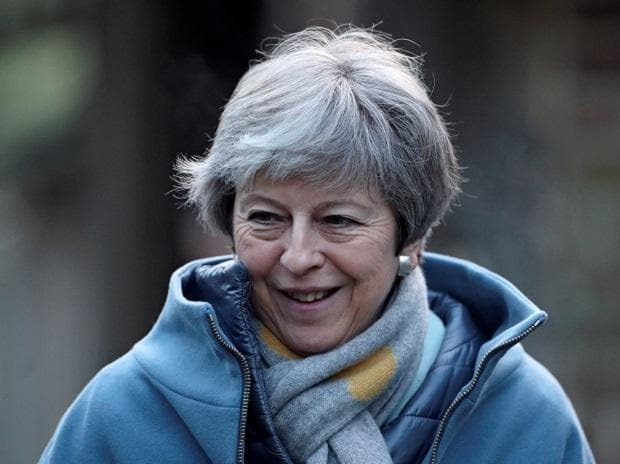 Prime Minister Theresa May puts her Brexit deal back to Parliament on Tuesday to try to undo the historic defeat it suffered in January. It’s unlikely she will have secured enough concessions from Brussels to win over lawmakers, leaving her with just one strong card to play: If they vote down her deal, Brexit could be abandoned in all but name -- or even altogether. May has promised that if members of Parliament reject her divorce treaty, they will then get a vote on whether to take the country out of the European Union into legal limbo -- an option previous ballots have shown they will reject. Then there will be a vote on postponing the March 29 exit day. Negotiators are working through the weekend to try to find tweaks to the deal May negotiated last year to make it more acceptable to Parliament. Both sides are gloomy, but we’ve seen last-minute breakthroughs before. Whatever is agreed must convince the pro-Brexit faction of the Conservative Party and also the proudly obstinate Northern Irish lawmakers who prop up her government. If she pulls it off, markets will rally. If the deal is rejected, the most likely next step is that members of Parliament start maneuvering to force the government into a softer Brexit policy that can win cross-party support. Labour leader Jeremy Corbyn has already been talking to backbench members of the Conservative Party who want to maintain close ties to the bloc. Norway Plus and the Customs Union will be back on the table. Markets will see this as moderately positive. If she’s defeated on Tuesday, the prime minister could be tempted to give lawmakers one more chance to back her deal -- now that the prospect of an extension to Brexit day is before them. It’s not clear when she might do this -- but it could be as soon as next week. Members of Parliament are set to put forward amendments next week calling for a second referendum. Labour has come out in favor of a second vote -- albeit with some reservations. There’s probably still not a majority in Parliament for a re-run, but that could change in the weeks ahead. May said on Friday the chances of another plebiscite have gone up since Labour changed its position. Expect her to keep playing that up as she tries to convince purists that her version of Brexit is better than the risk of none at all. Markets see a second referendum as positive. It’s just possible that no majority for any kind of Brexit emerges in Parliament. If that happens, Parliament remains gridlocked, the EU reluctantly agrees to a short extension to avoid the pain of no-deal, and in three months time we’re back to the cliff-edge. This is what Brexit hardliners are hoping for -- that they will get another chance to force May to take the U.K. out of the bloc with no deal. Markets will slump if this starts to look likely.